As some of you may know, we’ve been experimenting with infusing our own spirits as a more immediate way than homebrewing to do exciting at-home DIY booze things. I’m not going to claim this is a new idea, if anything it just seemed like a crazy hoity-toity out-there idea until our friends infused their own vodkas a few years ago with a variety of fun and crazy things in small batches (and then made their own bitters – what?!). But over the summer, Mike and I, thanks to his parents’ CSA, came into quite a bit of basil. Like bagfuls. We had to find a timely way to use it beyond the usual pasta/pesto combination, so we thought we’d finally try our hand at infusing our own spirits – and haven’t stopped since. After extensive internet research to find the perfect combinations of flavors suitable to our tastes and getting a sense of the process, I realized that there really isn’t a site that has just a chart with all of the things they like to infuse and how long to let it sit for before trying. That was the original goal of this post, but as I write it I realize it’s not as exhaustive as I’d like, and really more like a recap of what I’ve done. Hence, I have included some links/ information I have located that I have not tried, but have greatly considered and if I ever do, will update. Sounds good? Great. Do not use nice / the best you can find. That’s just stupid. Use a slightly above bottom shelf or even mid-shelf brand. We used Prairie vodka once and it felt wasteful, so instead I would recommend just your old friend from college, Smirnoff. Or in the case of gin, Beefeater. Shake daily. Agitation is key to infusing, and plus it’s kind of fun. So on a daily basis, check out what’s going on, especially with the colors because it’s beautiful, and give it a little shake. You can even do this multiple times a day, if it strikes your fancy. Make sure the lid is airtight before, though. Leave in a cool, dark, dry place. Dark is better, light does weird things to liquids. Fresh ingredients are better, especially if the alternative is frozen. My favorite is by far the first one on the list, what we refer to as a Pizza Blood Mary. When combined with a high quality and deliciously moderately spicy bloody mary mix, the flavors come together to taste a lot like a pizza. Spicy, fragrant, fresh. We’ve made this one every time we’ve infused, and now we just make it by the handle. Most recently we made this using a handle of Trader’s Joes cheapest vodka and it was awesome. Cut off the tops of the jalapenos, or you can cut them in half, toss them in, take the skins off the garlic and stuff in the basil. Fill with vodka, cover, shake a little. Things will settle and you can top with more vodka. Close again, shake and set aside. 3-5 days later, check it out. It should have a little green color, the basil leaves will start to look like they’re wilting a little bit. I wouldn’t go much longer than 5 days because they begin to disintegrate and honestly the jalapenos might get too spicy/give too much flavor. Get a little funnel and put a coffee filter in it. Pour the liquid through it. This may take a few minutes so be patient, or if it begins to take too long, get a new filter. If you cut the tops off the jalapenos be sure to pour their juices through the filter manually – that’s valuable vodka! Generally they say to pour the infused spirit into a new clean container but I normally use a pitcher or something as a mid-way point. I filter the infused spirits into the pitcher, dump out the booze-saturated produce and give it a rinse. Then I pour the infused liquor back into the original receptacle. You don’t need to refrigerate or anything. One side note: the Pizza Bloody Mary vodka might turn a slight brown color after all the basil is out and you’ve filtered it through – just some oxidization occurring. Similarly, the other liquids will gain some of the color from the things you put in there. Embrace it! 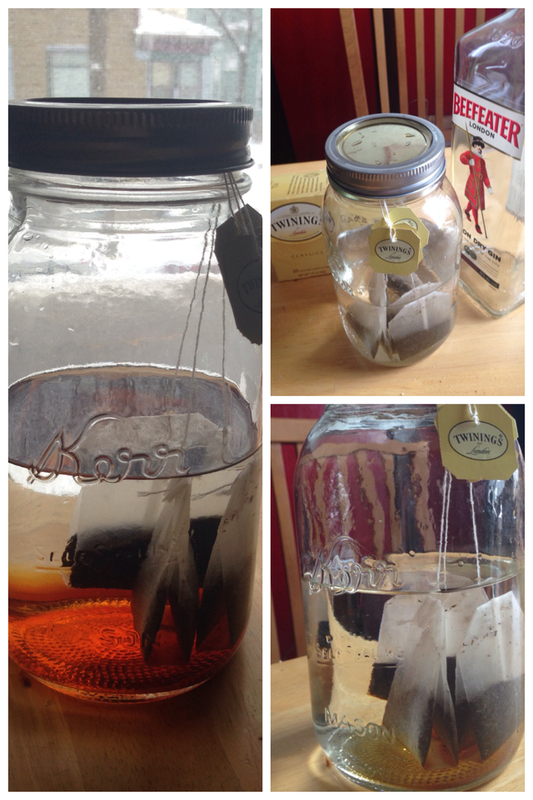 For a slight variation, I have also made Earl Grey tea infused gin and it is AMAZING. I have no distinction between a ‘summer’ and a ‘winter’ drink, because I like stouts and gin and tonics all the time SO the Earl Grey tea infused gin we do makes a fantastic gin and tonic. Plus it only takes 3 hours. The tea adds that nice bergamot flavor and cuts the astringent bite of the mid-shelf gin. Top with lime as per usual and enjoy. One thing we haven’t really talked about is what to do with the infused spirits after you made them. I say that besides a nice La Croix (pamplemousse flavor, plain or otherwise) is always a good choice. But we also like lemonade and/or Squirt with the other basil-y infusions to enhance the flavor, except the ones that already have lemon/lime in them, in which case soda water is a better choice. To top it all off – and some of you can attest to this – we made brandied cherries this holiday season for our fancy liquor-inclined friends. It’s literally the easiest thing and once you have one, you’ll never want to go back to maraschino cherries and/or any other half-assed garnish. Oddly enough, I used this Buzzfeed recipe (the only thing Buzzfeed has ever been good for) but added slices of orange peel. It’s a 1:1:1 ratio between water, sugar and brandy (I used the good old E&J). You make a simple syrup with a cinnamon stick and when everything is mixed and you can’t see any more sugar in the water, add the brandy – dear god don’t put the brandy in while the stove is on. Throw in a few beautifully cut orange peels. Fill whatever container you have with pitted cherries (I used frozen ones, which worked fine) and then pour the mixture over all of it and close. Mix it up. Things will settle a little bit, allowing more space for the liquor/sugar, so add more, and then reclose. Be sure to put the orange peel pieces and the cinnamon stick in there too so it looks beautiful. Refrigerate. Let the flavors infuse for a week and enjoy. Keep in the fridge and eat as many as possible because from the time you make them to the time they kind of go bad you have about a month. PUT THEM IN EVERY DRINK YOU MAKE. BoulderLocavore blog: Where I got my inspiration for the lemon ginger infused vodka. Check out the cocktail recipe with vermouth and lemon bitters. Yes, please! The Framed Table blog: Where I got my inspiration for the Earl Grey tea infused gin. Look how fancy that recipe is! I think I’ll skip the rose tea buds though. The Kitchn always has good ideas. Fig infused vodka!! Nosh.On.it. Other ways to use basil – basil and cucumber? Good idea. As many of you know, there’s nothing I like more than a good brewery creation story, especially when I’m on my one-billionth brewery tour. But I’m talking deeply-rooted cultural beginnings type of creation story that defines the brewery’s entire life and being, not just “I homebrewed and I was good at it, then a lot of people said I should start a brewery so then I did.” Like all of the world’s cultures, microbreweries have—and need—them too. Something that reminds them of why they’re doing what they’re doing, what drew them into beer, what makes them a brewer you the consumer should come to know, respect and even love, like you would your a person. The creation story is frequently alluded to in the brewery’s name or the taproom décor or the beers they brew or the names they choose for those brews. But it’s everything. No creation story, no soul. You’ve heard them all. Half Pints brewery in Winnipeg was started by a man who began his brewing career at a Big Brewery where he would get free beer at the end of every shift. A family man (who told me that there are two types of brewers out there: scientists and drunks, he of course being the former) who just wanted to top off his day and get home, would only order 8 ounce pours, earning him the nickname, and name of his future brewery, “half pint”. 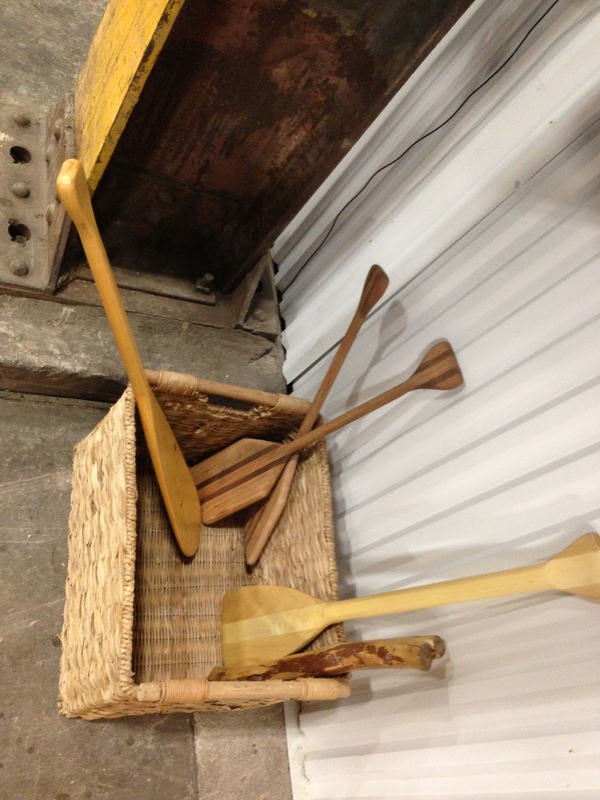 Bent Paddle in Duluth was started by a man who, while brewing at Rock Bottom, and was looking for a mash paddle that would do the job juuuust right, and realized he had the perfect thing in the trunk of his car—a bent canoe paddle. It worked wonders, and beyond becoming the name of his own brewery, it is now a mainstay on the floor. These stories are for real. These people are for real. Sure, maybe these quaint stories have been molded into the truths that are told by tour guides or bartenders or local beer nuts, but if we believe them to be true they are true and their stories become our stories. Like them, I’m sure you have a story of when you first discovered craft beer. Of when you first discovered your love for homebrew. Of when you began your journey into commercial-microbrewing. Mine to come at a later date. I would say the stories are what makes craft beer so fascinating. But the weird thing is, the Big Guys have them too. They are some of the oldest and most historically-significant corporations of our time and their stories are deeply rooted in some of the same things our favorite craft breweries are, like the entrepreneurial spirit, elegant craftsmanship, and building a tradition based on that of our forefathers. But beyond that, they helped build statistics as we know it today, branding as we are in awe of today, and industry that many can only dream of. But what makes their stories different? My uncle, who pretty much only drinks Miller Lite connects to the brand as much as I connect to Indeed Brewing (which is, for the record, probably my favorite Minneapolis brewery) but dare I say he connects on an even deeper level. It was the beer his father, my grandfather, drank every day after a hard day of work a machinist; it was the beer he guzzled in college; and it is the beer he now chooses for his games of golf. So as much as the craft beer revolution is based around being the other, microbreweries setting themselves apart from the Big Boys by defining themselves as something they’re not, intentionally creating a cultural fission between micro and macro, I only see the two becoming more similar, more united, more one. I mean, Summit is already doing throwback labels, building a brand based on nostalgia and a history of quality – um, that sounds familiar! But I don’t have an answer to this and I definitely don’t have a solution, perhaps because I don’t truly see it as a problem (Cocky Liz just thinks “Well, macrobreweries just keep losing market share, and clamber to gain it back to no avail, so no worries. Right?”). 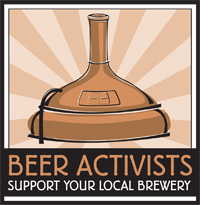 Maybe the issue is that as craft beer lovers we’ve built a healthy amount of hatred towards the category leaders; we want to support our local favorites, our friends, our city. But how different are they really?